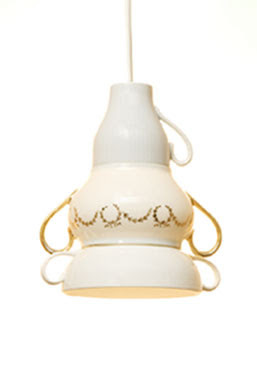 I found myself quite charmed by the work of Swedish designer, Malin Lundmark, who makes poetically functional design. This is the glass Vira lamp, that has its cord wound around its middle, to be used in whatever length necessary. 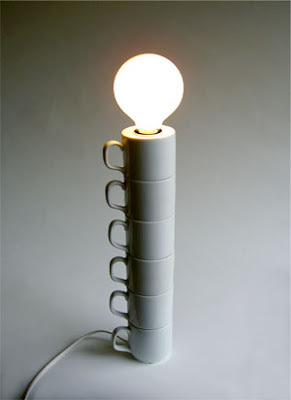 I love the lamp made of stacked mugs, and she’s also made one from wonkily piled up plates. 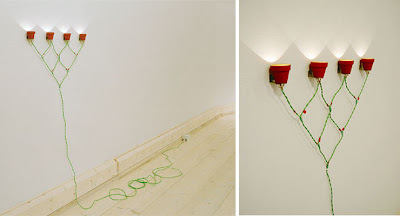 The Pot-lamp has a green cord that climbs the wall like a creeper, ending in terracotta pots with lights inside. Charming. 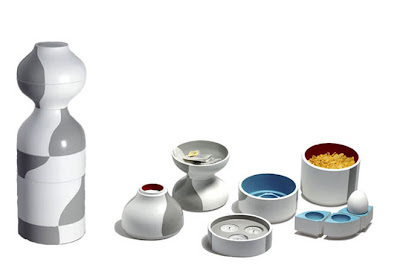 Mr Hide is a functional space saver that contains all the bits and pieces needed for breakfast. And Coffee-Cup-Lamp is exactly what it says it is. Love the way the cup ears create a graceful decoration.